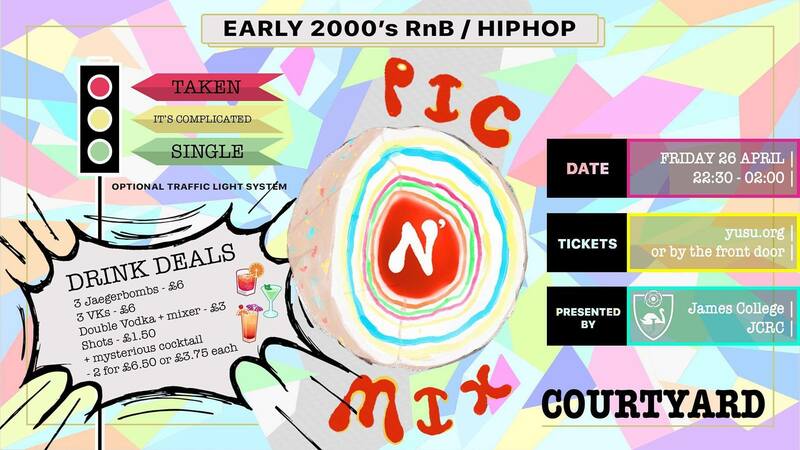 PREPARE YOURSELVES FOR THE FIRST EVER PIC N’ MIX CLUB NIGHT! As well as a night of retro tunes, the evening also includes an optional Traffic Light system - so whether you’re taken, on the fence, or single and ready to mingle, don your red, amber or green glow sticks (which will be provided on the night) and put yourself out there! Buy your tickets for £3.50 on the YUSU website to guarantee yourself entry or come down early for £3 tickets on the door – make sure you beat the rush though, Courtyard will fill up quickly! SEE YA THERE FOR THE FIRST EVER PIC N’ MIX!